During poxvirus infection, dysregulated mTOR (orange) localizes at the host-cell golgi network resulting in degradation of the DNA sensor, cGAS (green). 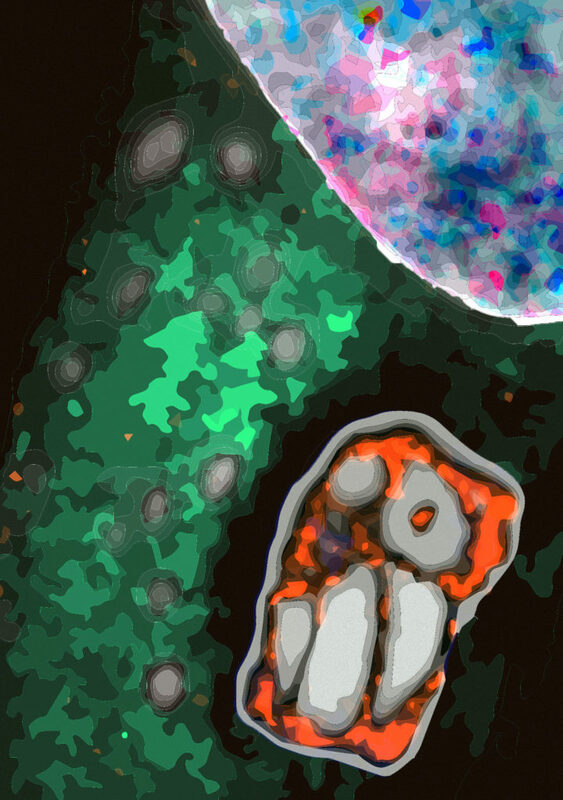 A Northwestern Medicine study has uncovered how poxviruses take control of a protein complex called mTOR in order to enhance their replication and counteract a host’s immune response. The study, published in the journal Cell, was led by principal investigator Derek Walsh, PhD, along with Mojgan Naghavi, PhD, associate professors of Microbiology-Immunology. Nathan Meade, PhD, a postdoctoral fellow in the Walsh laboratory, was the first author of the study. Poxviruses are a group of large, complex DNA viruses that are unique in replicating within the cytoplasm — rather than the nucleus — of infected cells. Poxviruses include the Variola virus, which causes smallpox, a highly infectious and deadly disease. Although smallpox was eradicated after the development of a vaccine, related poxviruses in animals can adapt to infect humans and continue to pose a serious threat to public health. In the current study, the scientists sought to understand how poxviruses exploit mTOR — a protein complex which regulates cellular metabolism and protein synthesis — and evade being sensed by host cells. “We found that it does this in a manner totally different to other viruses reported to date and through a protein that seems to be unique to poxviruses,” explained Walsh, also a member of the Robert H. Lurie Comprehensive Cancer Center of Northwestern University. By studying Vaccinia virus — the virus used for smallpox vaccination and in most laboratory studies of poxviruses — the scientists discovered that poxviruses encode a protein called F17 that dysregulates mTOR, allowing the virus to counter an antiviral response in the cell and also reap the metabolic benefits of mTOR. Beyond deepening understanding of poxvirus infection and immune responses, the findings also provide essential insights into other research areas as well. For example, poxviruses are now being employed as vectors for vaccines and gene therapy, as well as oncolytics (viruses that infect tumor cells) used to treat cancer. “In this study, we used Vaccinia virus as a tool to discover a fundamental aspect of cell biology. This has implications for future research into not only poxviruses, but in many other areas too, including the development of therapeutics against disease-causing microorganisms,” Meade said. In ongoing research, the team is now working to understand the contribution of different DNA sensors to detecting poxvirus infection. “It is helping us to piece apart whether there is a single dedicated sensor or multiple levels of detection designed to help protect the cell and mount an immune response,” Walsh said. The study was supported by grants from the National Institutes of Health R01AI127456, R21AI105330 and R01GM101975, and training grant T32 AI0007476.